Dame Elizabeth "Liz" Rosemond Taylor, DBE (February 27, 1932 – March 23, 2011) was a British-American actress. The movies she starred in were, National Velvet, Father of the Bride, A Place in the Sun, Giant, Cat on a Hot Tin Roof, and Suddenly, Last Summer. She won the Academy Award for Best Actress for BUtterfield 8. She played the title role in Cleopatra, and married her costar Richard Burton. They appeared together in 11 films, including Who's Afraid of Virginia Woolf?. Taylor won a second Academy Award in Who's Afraid of Virginia Woolf?. From the mid-1970s, she appeared less frequently in film, and made occasional appearances in television and theatre. Her personal life included eight marriages and several life-threatening illnesses. From the mid-1980s, Taylor supported HIV and AIDS programs; she co-founded the American Foundation for AIDS Research in 1985, and the Elizabeth Taylor AIDS Foundation in 1993. She received the Presidential Citizens Medal, the Legion of Honour, the Jean Hersholt Humanitarian Award and a Life Achievement Award from the American Film Institute. The American Film Institute named her seventh on their list of the "Greatest American Screen Legends". Taylor died of congestive heart failure in March 2011 at the age of 79 after suffering many years of ill health. Taylor was born in London to American parents, Francis Lenn Taylor and Sara Sothern, who were Americans living in England. Her parents were originally from Arkansas City, Kansas. They returned to the United States on the onset of World War II. Her first act was in Lassie Come Home (1942). The next one was National Velvet (1944). Throughout her teens, she appeared in various supporting roles and easily made the transition to young adult parts. Her first major role was in A Place in the Sun in 1950, with Montgomery Clift. Working steadily during the 1950s, notable movies have included; The Father of the Bride (1951), Ivanhoe (1952), Elephant Walk (1954), Rhapsody (1954), Giant (1956), Raintree County (1957), Cat on a Hot Tin Roof (1958), Suddenly last Summer (1959), BUtterfield 8 (1960), etc. 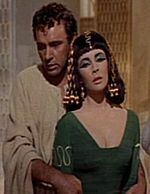 In 1963, she played the lead role in Cleopatra and met actor Richard Burton, who became her fifth husband in 1964. They appeared in several movies together; The V.I.P's (1963), The Sandpiper (1965), Who's afraid of Virginia Woolf ? (1966), The Taming of the Shrew (1967), Boom (1968). She also starred in Secret Ceremony (1969), X, Y and Zee (1972) and Ash Wednesday (1973). She has won two Academy Awards for best actress, the first for her performance in Butterfield 8, the second for her performance in Who's Afraid of Virginia Woolf?. In 1999 she won the BAFTA Academy Fellowship Award, a lifetime achievement award. Taylor often received media attention because of her many illnesses and controversial marriages to well known figures such as Nicky Hilton, Michael Wilding, Mike Todd, Eddie Fisher, Richard Burton (twice), John Warner. She has two sons with Michael Wilding and a daughter with Mike Todd. She also adopted a daughter while married to Richard Burton. She was the godmother of two of Michael Jackson's children. Taylor devoted consistent and generous humanitarian time, advocacy efforts, and funding to HIV and AIDS-related projects and charities. She helped to raise more than $270 million for the cause. She was one of the first celebrities and public personalities to do so at a time when few people knew about the disease and organized and hosted the first AIDS fundraiser in 1984 to benefit AIDS Project Los Angeles. Taylor was cofounder of the American Foundation for AIDS Research (amfAR) with Dr. Michael Gottlieb and Dr. Mathilde Krim in 1985. Her longtime friend and former co-star Rock Hudson had disclosed having AIDS and died of it that year. She also founded the Elizabeth Taylor AIDS Foundation (ETAF) in 1993, created to provide critically needed support services for people with HIV/AIDS. For example, in 2006 Taylor commissioned a 37-foot (11 m) "Care Van" with examination tables and xray equipment, the New Orleans donation made by her Elizabeth Taylor AIDS Foundation and Macy's. That year, after Hurricane Katrina, Taylor donated $500,000 to the NO/AIDS Task Force, a non-profit organization serving the community of those affected by HIV/AIDS in and around New Orleans.The donation was shared by Taylor for her celebration of her 74th birthday and to help NO/AIDS Task Force continue their work on fighting AIDS. Taylor was honored with a special Academy Award, the Jean Hersholt Humanitarian Award, in 1992 for her HIV/AIDS humanitarian work. Speaking of that work, former President Bill Clinton said at her death, "Elizabeth's legacy will live on in many people around the world whose lives will be longer and better because of her work and the ongoing efforts of those she inspired." After she converted to the Jewish religion, Taylor worked for Jewish causes throughout her life. In 1959, her purchase of Israeli Bonds caused Arab boycotts of her films. In 1962, she was prevented from entering Egypt to complete Cleopatra; its government announced that she would not be allowed to come to Egypt because she had adopted the Jewish faith and "supports Israeli causes". However the ban was lifted in 1964 after it was considered that the film had brought good publicity to Egypt. In 1974, Taylor and Richard Burton considered marrying in Israel, but they were unable to do so because Burton was not Jewish. Taylor helped to raise money for organizations such as the Jewish National Fund; advocated for the right of Soviet Jews to emigrate to Israel and canceled a visit to the USSR because of its disapproval of Israel due to the Six-Day War, along with signing a letter protesting the United Nations General Assembly Resolution 3379 of 1975. She offered herself as a replacement hostage after more than 100 Israeli civilians were taken hostage in the Entebbe skyjacking in 1976. After the success of the operation, which freed the hostages, she acted with Kirk Douglas in a TV special, Victory at Entebbe, broadcast in January, 1977. When she experienced the role, she stated, "I couldn't pass up this opportunity. I have strong ties to Israel and I firmly believe in the courage and dedication of the Entebbe mission." Taylor had a lot of health problems. In 2004, she was diagnosed with congestive heart failure. In 2009, she underwent cardiac surgery for it. In early 2011, new symptoms related to congestive heart failure caused her to be admitted into Cedars-Sinai Medical Center for treatment. Taylor died on March 23, 2011, surrounded by her four children at the same medical center in Los Angeles, California, at the age of 79. Taylor's relationships were subject to intense media attention throughout her adult life, as exemplified by a 1955 issue of gossip magazine Confidential. Elizabeth Taylor Facts for Kids. Kiddle Encyclopedia.